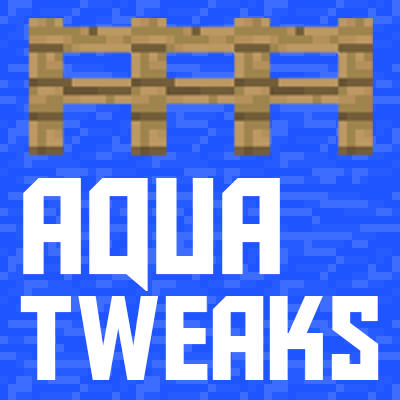 AquaTweaks is a small, clientside, coremod, which aims to improve the way fluids look around non-solid blocks. In its essence, it renders fake water into ladders, fences, signs and the likes, making them not look as derpy underwater. Note that these changes are purely of graphical nature. Fluids will not actually flow through blocks, but simply render into them. In addition to that, this mod allows other modders to register their blocks for tweaking. Due to the technicality of that process, I'm going to spoiler it. There is two options. either implement the interface "blusunrize.aquatweaks.api.IAquaConnectable" in your block (this supports the @Optional annotation"), or send an IMC message. Users of the interface get the benefit of having world and coordinates passed, allowing possible TileEntity interaction, furthermore, the get one method to check if water should render a side towards the block and another which determines if water should be rendered into the block. You can also add an integer under the key of "meta" if you only want a certain metadata of the block to AquaTweaks. Without meta, it will default to 32767, the universal wildcard value for damage. IMC messages are sent to the ModID "AquaTweaks". Mojang liked this mod so much that they made it vanilla. I would love a 1.12.2 version, though! GUYS GUYS I THINK YOU CAN DO THIS IN 1.12.2! you get worldedit, to fixwater and do the radius and the water is fixed! Heyo, This looks like an amazing mod. If you do attempt a port, good luck! No. Forge isn't even out. I think that's the joke. lol. Mojang putting this in vanilla soon. I guess no update required then. Location: On top of Mount Everest-haha! What about Minecraft 1.8 to 1.12? You're probably not working on this anymore (And if you are, I don't know if you'll see this), but there's a weird freezing issue between this and bspkr's World State Checkpoints mod. For some reason, it seems that when their mod attempts to back up the world, the game just freezes. No crash, just infinitely stuck on the last rendered frame. I don't think there's a report or anything, but it's really unfortunate, since I cannot risk disabling the backup mod due to occasional power outages that have corrupted worlds before. Because rendering is entirely different in 1.8+ versions and porting this is currently neither easy to do (maybe even impossible), nor my priority. Can I use this in a modpack? Sorry, I didn't want to look through the liscense but if I am bothering you I will.